Classic Garden Retreat tapestry shows the work of artist James Lee. Born in South Korea, then moving to California where he created landscape and seascape views, he later moved to Glendale, Arizona, where he regularly displays works in his galleries. 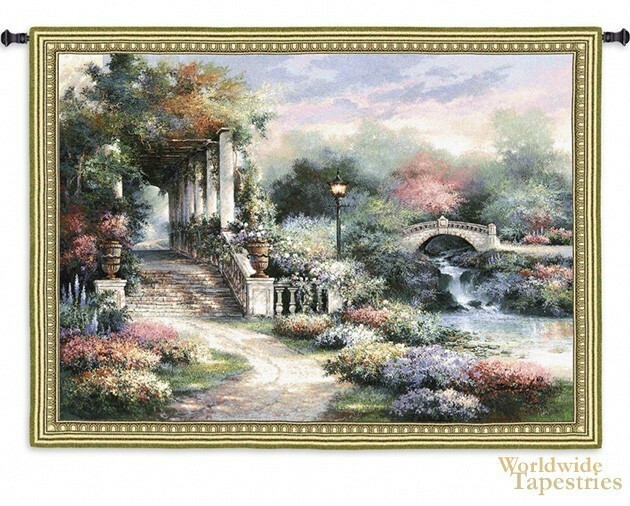 Here we see a classic scene of columns and bridges in a colorful floral scene of pinks, violets and yellows. Green shrubs are all around and are also in the gazebo above the columned path. A flowing stream is seen below the bridge creating a small waterfall effect. This Classic Garden Retreat tapestry is backed with lining and tunnel for easy hanging. Note: tapestry rod and tassels, where pictured, are not included in the price.